We, in conjunction with Artist Home, are thrilled to bring back our Bend Concert Series! Enjoy live music every Saturday night, year-round, at LOGE Bend. Based out of Seattle, All Star Opera at surface level is a Hip-Hop/Soul band. Listen a little closer and one will find a collective of artists balancing a diversity of talents and influences. Two emcees, Flow Carter and Oz + a four-piece band play back and forth creating a vivid sound migrating between genres with both attitude and grace. This is Hip-Hop. This is Soul. This is a collective experience being channeled by a band of brothers in groove. This is a full moon in the middle of the day. Or as the six-fingered beast says, this is All Star Opera. “Take Miles Davis and hope, Anthony Kiedis and a journey, Kahlua and cream and confidence, your best Nicaraguan cigar and slippers, a cozy, dimly lit corner booth, a soft rain Sunday afternoon and Weezer, a little heated massage oil and Black Thought and those hanging, beaded room dividers. Now, pour that in your ear. 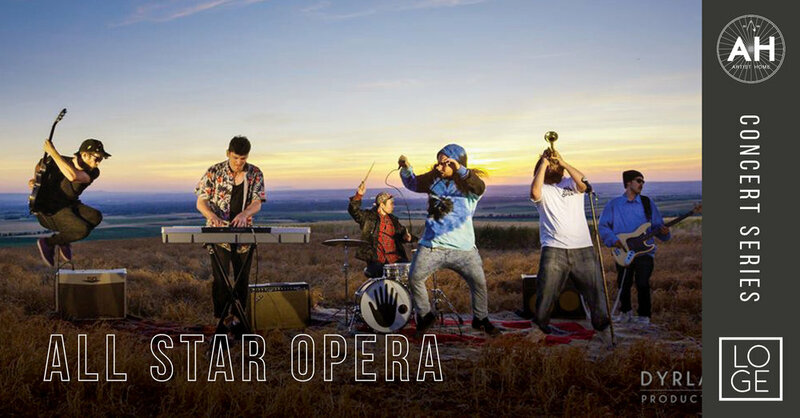 All Star Opera is the nexus where groovy, meets a rock star hustle; for the last two years the six-fingered beast has been tearing through the Pacific Northwest music scene. Since dropping their debut EP (2016) + LP (2017), the band has played 50+ shows all over the western United States, unleashing the magic at clubs, parties and many notable music festivals. To top it off, All Star Opera was voted Seattle Weekly’s ‘Best Band in Seattle’ 2017. With ASO the goals are simple, make great music and have fun while doing it.